The following is a guest post from Jitesh A. Kuntawala, a student at the University of Florida. He'll be graduating in 2015 with a Masters degree in nuclear engineering. 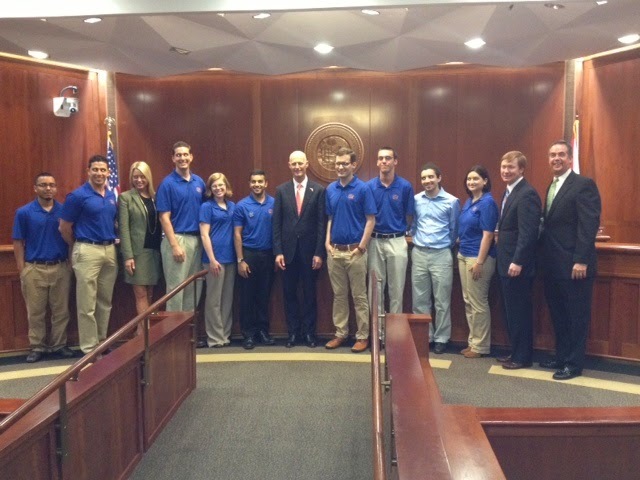 As a graduate student in nuclear engineering I recently had the opportunity, along with 8 other nuclear engineering students from the University of Florida, to become active in the public policy side of the nuclear industry. On May 13, 2014 Florida Governor Rick Scott and his cabinet, sitting in their capacity as the Florida Power Plant Siting Board, held a final hearing for the determination of site selection for the proposed two new reactors to be known as Turkey Point units 6 & 7 at the existing Florida Power and Light (FPL) site near Miami. We were initially contacted by Jerry Paul of the Energy Information Center (EIC) and invited to attend the hearing. We are thrilled we did. It was a wonderful, engaging, and educational glimpse into some of the decision making bodies behind the nuclear industry. The Governor, Attorney General, Commissioner of Agriculture, and the Chief Financial officer all recognized our group in the audience. The paused the proceedings and called us to the dais for a group photograph were they commended us for our efforts. It was stimulating to see the interactions of opponents and proponents in this public governmental proceeding. Gov. Scott and the "Student Army." Our input seemed to be very well-received by the cabinet and proponents of the new reactors. Following the public comment, the Siting Board voted unanimously to approve the proposed site. The experience was part of an ongoing EIC initiative (called the “Student Army”) to help our fellow engineering students to become more engaged and visible in the increasingly important public policy debates that affect America’s ability to utilize clean nuclear energy as a reliable supply of electricity. We are hoping to curb the disconnect between policy makers and future engineers and scientists. For example, our group has also provided testimony in Orlando at the NRC hearings for the federal Waste Confidence rulemaking, and in front of the Florida Senate Committee on Communications, Energy, and Public Utilities in favor of Florida’s nuclear cost recovery law. We hope other engineering students across the country engage in these opportunities. We as nuclear engineering students are studying everyday so that we can be a part of our nation’s safe, reliable, and zero emission energy future. To do so our generation must speak out and be heard. Its great to see so many Gators interested in this innovative technology, and what Florida Power & Light is bringing to the region.